Novak Djokovic outlasted Rafael Nadal in five sets. Novak Djokovic overcame Rafael Nadal in another epic Wimbledon semi-final. The Serbian former world number one will face Kevin Anderson in Sunday’s final after an absorbing 6-4, 3-6, 7-6 (11/9), 3-6, 10-8 victory which took five-and-a-quarter hours. The match was watched by a crowd that included the Duchess of Cambridge and Duchess of Sussex, who had front-row seats in the Royal Box. It was the second longest semi-final in wimbledon history with the longest, of course, having taken place 24 hours earlier. The 52nd meeting between these two great rivals was delayed by the six hours and 36 minutes it took Anderson and John Isner to play their match, with Djokovic taking a two-sets-to-one lead before play was suspended just after 23:00 on Friday. Nadal will regret his missed opportunity the night before, when he was in the ascendancy but passed up two set points. But while Anderson and Isner’s titanic tussle was more an exercise in totting up aces, this was a cast-iron classic. 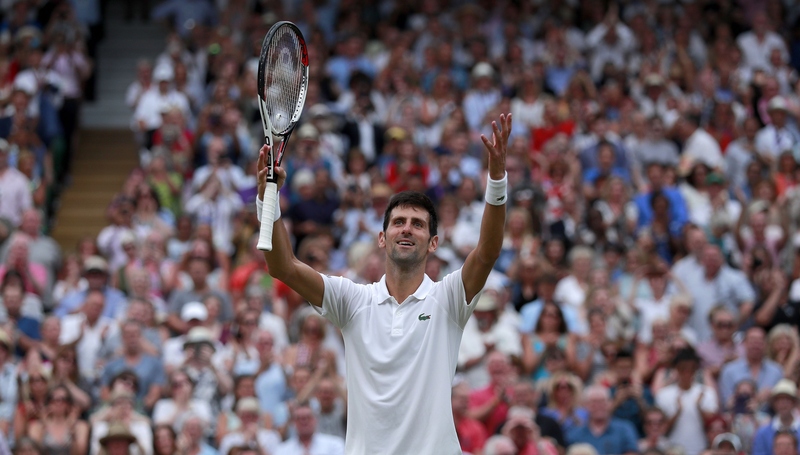 "Novak Djokovic is in the #Wimbledon final again"
The Centre Court roof remained closed, and the players carried on where they left off, raising the level of tennis seen at the championships so far by several notches. The opening game alone, on Nadal’s serve, was 15 minutes of blistering groundstrokes and stunning winners, the Spaniard fending off two break points amid six deuces to eventually hold. Yet when Djokovic’s serve was placed under scrutiny it promptly caved in, Nadal breaking to 15. Nadal gifted a break back with a suddenly sloppy service game but when he struck again for 5-3 Djokovic’s frustration boiled over and he began hammering the sole of his shoe with his racket. Djokovic forced three break points but Nadal hauled himself level and clinched the set with an ace – called out but correctly challenged – to take the match into a decider. South African Anderson, presumably watching somewhere with his feet up, will have no doubt been pleased. Djokovic was under the cosh in the next but two booming serves saved two break points and suddenly Nadal found himself at 0-30 as he served to stay in the match. Once again his first serve was his saviour and the match started to enter prime Anderson-Isner territory. At 7-7, Djokovic double-faulted for 15-40 but again got out of that hole before a simply sensational forehand winner saved another break point. The atmosphere, in sharp contrast to Friday’s slug-fest, was electric. Djokovic converted his game point and urged the crowd to its feet, Nadal converted a smash and raised his arms aloft. Nadal was flagging, though, and it told in the 18th game of a 91-minute final set. Djokovic raced to 40-0 and when his rival’s tired forehand floated long, the 12th seed raised his arms again. Of the task against Anderson, Djokovic said: “Hopefully we can first of all play, both of us get out on court. It’s been a roller coaster ride for him, the last couple of rounds, but he’s had a day off which means a lot. I wish I could have had one. Nadal said: “It has been a great match – I think a fantastic level of tennis for both of us. I was not a spectator, but I think it was a great show for the fans. 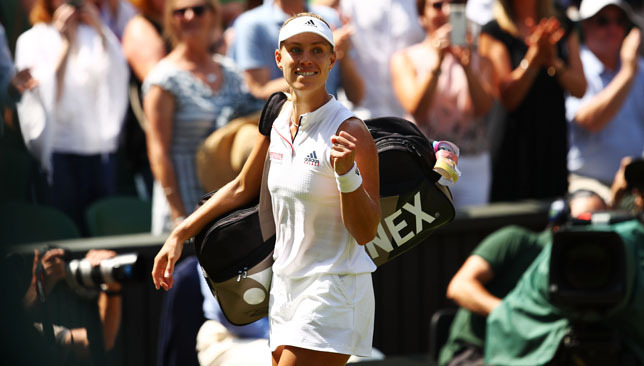 Angelique Kerber has her heart set on winning a first Wimbledon title after booking a return to the final. The German beat Jelena Ostapenko 6-3 6-3 in their semi-final and is one win away from a third grand slam triumph. Her previous trophy successes – at the Australian Open and US Open – came in the same glorious 2016 season as her first run to the final at the All England Club. On that occasion, Kerber was beaten by Serena Williams in a thrilling encounter. She will now get a rematch with the seven-time champion after Williams beat Julia Goerges in the second semi-final. The form of two years ago sent Kerber to world number one and she is again playing at a similarly high level after a horror 2017 campaign. “Wimbledon is a really special place. I think everybody knows this tournament. It would be really special to win,” she said. “But it’s still a long way off. I know that I have to play my best tennis in the final. “For sure it’s really special. I know it will be a full house there. The atmosphere will be amazing. “I’m looking forward to having the feeling again. “With 2016, all the success, 2017, with a few up and downs, to coming back this year, I think I learned so many things about me. 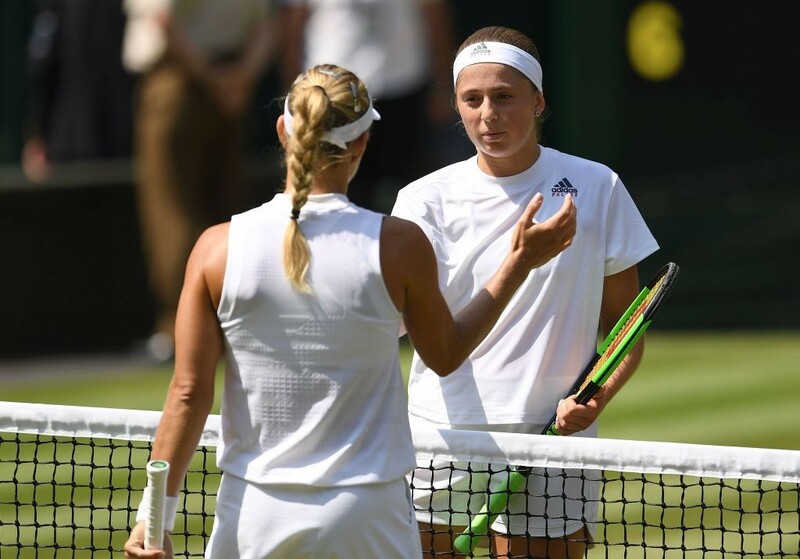 Her semi-final was billed as attack versus defence and it was the solid, reliable manner of Kerber that prevailed as she let an erratic Ostapenko, who was going for winners on almost every shot, hand her a swathe of free points. Ostapenko had an off-day against Kerber in the semi-final. Ostapenko won the French Open in 2017 by playing in this manner and knows no other way, but she had an off day and, despite hitting 30 winners, it was her 35 unforced errors that cost her any chance of progressing. In comparison, there were just seven errors off the racket of Kerber and that tells the story of where the match was won. “She is a player who tries to be aggressive from the first point,” Kerber added. Having seen her defence of the French Open end at the first hurdle last month, Ostapenko was pleased with her Wimbledon campaign but knows where she has to improve. “I’m working on my consistency,” she said. “It’s not like I want to hit every ball so hard. “Sometimes in the match that happens because I really want to hit a winner, I want to win the point. 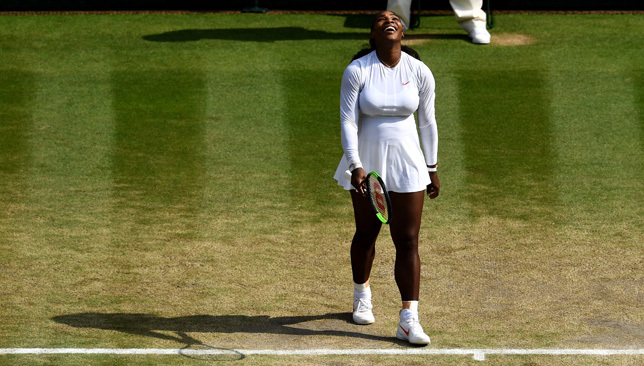 Serena Williams put on a superb display of power and athleticism at Wimbledon to reach her 30th Grand Slam singles final. The 23-time Slam champion, who will equal Margaret Court’s all-time haul of major titles if she beats Angelique Kerber on Saturday, needed just an hour and 10 minutes to defeat Julia Goerges 6-2 6-4. Williams, who gave birth to daughter Olympia just over 10 months ago, produced the most impressive display of her comeback and will now attempt to stage a repeat of the 2016 final, when she defeated German Kerber in straight sets. Goerges was playing in her first slam semi-final and Williams her 35th, so it would have been no surprise if the German was a little over-awed, but far from it. The 29-year-old came out hitting the ball cleanly and landing plenty of winners but, after four very competitive games, Williams pulled away. Goerges was the first top-50 player the American had faced during the tournament so there was a sense she had not been properly tested, but Williams was simply on another level. Chasing down Goerges’ powerful shots and sending them arrowing into the corners, Williams, who has not lost a Wimbledon semi-final since being beaten by sister Venus in 2000, looked a woman on a mission. She reeled off the final four games of the opening set and quickly moved in front in the second. Goerges clawed her way back from 2-5 to 4-5, breaking the Williams serve for the only time in the match in the ninth game. But Goerges was broken again in the final game and, although she hit 20 winners to 16 for Williams, there was no doubt who was the superior player. The win extended Williams’ unbeaten run at Wimbledon to 20 matches, dating back to a third-round loss against Alize Cornet in 2014.